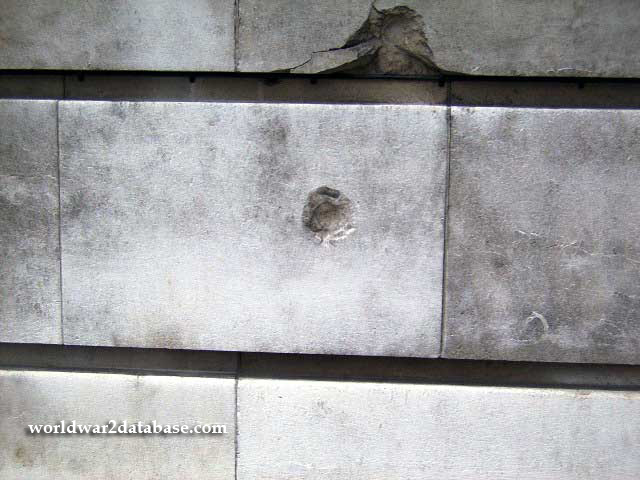 Close-up of damage to the Aston Webb façade of the Victoria & Albert Museum. The cluster of London museums in South Kensington, including Victoria & Albert, British Museum, British Geological Survey, The Natural History Museum, the Science Museum and the Imperial War Museum, came under attack at the start of the London Blitz in September 1940. The blast that did this damage also blew in the doors of the Victoria & Albert on Exhibition Road, at the time the museum's only entrance, and damaged the British Geological Society. The Victoria and Albert Museum had moved many items to safe storage outside of London in August 1939, but this blast exposed the interior to the elements.